How not to forget that one little cable, when you wire installation? Which KNX/EIB system to choose? 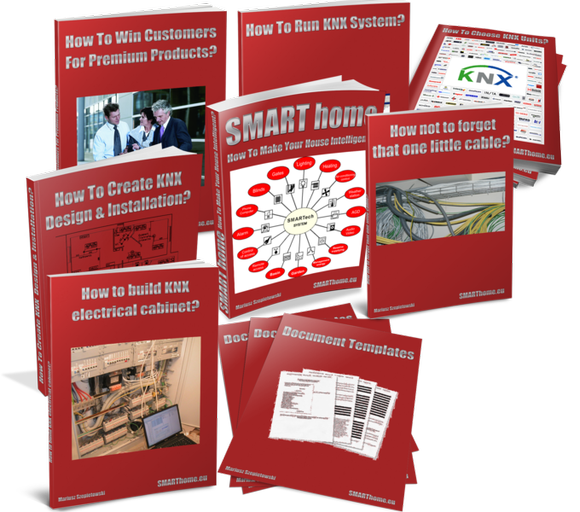 How to create a KNX/EIB design and intelligent installation? How To Pick And Choose KNX Equipment? How to build an electric switch cabinet for the KNX/EIB system? How To Start Up The KNX System? How to sign safe agreement for Smart Home system? These guidebooks are described below and are available separately, independently of the presented package. How to make your house intelligent? „How to make your house intelligent?" is the only publication on the market to gather all basic information about intelligent home systems in a reader-friendly guide form. The guide is targeted primarily at persons building or designing a house or flat, but also at specialists and designers who would like to get to know the basics or have them all together in one publication. The guide has over 160 pages ou www.smarthome.eu/a/order-general-guide. How not to forget that one little cable? The above listed guidebooks, bought separately, would cost EUR 497. Bonus 1: A general guide to 14 smart home systems available in Europe, with a table comparing their 36 features in detail. Bonus 2: special report: Which KNX/EIB system to choose? Why is this solution so interesting for you? Even up to 25 000 EUR – in case of the execution of several fully protected and secure orders for smart installations, a home theatre system or a multiroom system. 677 EUR – this would be the price of a DVD with the training course if we were to distribute it in this manner. 277 EUR – you only need to invest this much in order to receive this set of guidebooks. Thus you gain access to this information any time and anywhere you should need it.